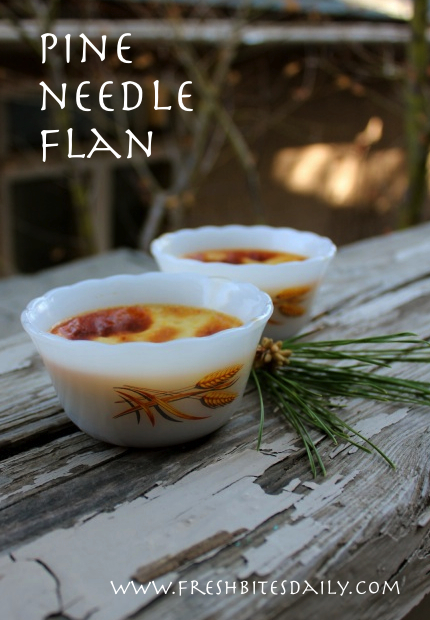 Our adventures on “The Lost Road” turned piney with Frederick’s request for harvesting pine needles and turning them into some sort of dessert (read more here). Thanks to some help on Facebook, I discovered that pine needle infusions were a thing and that we were about to embrace extreme coolness in our activity. Apparently the best flavor comes from the new pine needles, bursting out of the pine candles in the spring time — the pine tree’s new growth. Not waiting for spring, we decided to try it anyway. The adventure was such a success in fun and flavor that we do plan a re-adventure in the spring, expanded to include vinegar infusions. We made two primary ingredients with our pine needles: pine-infused water, pine-infused butter, and pine needle syrup. We used the water in tea, the butter in shortbread cookies, and the syrup in flan and sodas. In each case we tried to be extra cool and use whole food sweeteners but we found that the pine flavor is lost under the heavier flavors of molasses and such and recommend at this stage the white sugar approach for optimal piney experience. I provide basic recipes here but it is hard to imagine fully replicating anything when the core recipe calls for such immeasurables as “stuff as much pine into the water as you can.” You will surely want to experiment. Wondering what do you do with pine needles, I grabbed a copy of Darcey Blue French‘s Tree Medicine just to get a sense of how to get started. Her focus is on the therapeutic aspect of trees but I figured it was a good resource to keep us from killing ourselves while making butter cookies and flan. 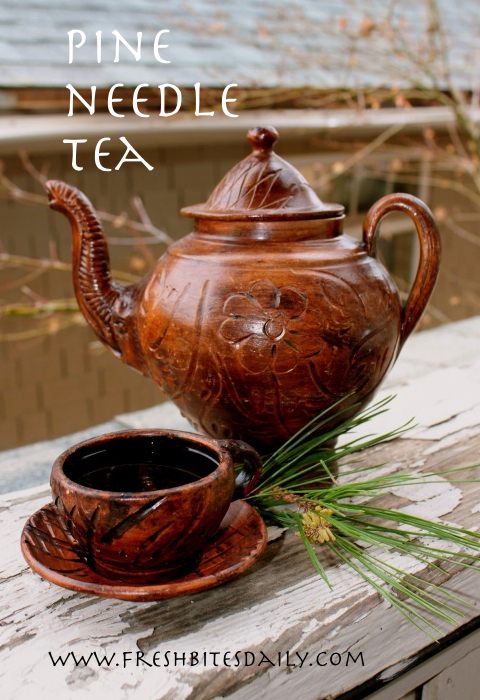 To make a pine needle tea, Darcey recommends 1 oz fresh or dried chopped needles, steeped or simmered in 1 quart of water. Pine needles are a mild expectorant, making them great for the unproductive, hacking coughs that might come with wintertime cold and flu symptoms. This would be a first, great simple pine project. Chop one ounce of pine needles. Bring to boil one quart of water. Pour over needles, cover, and steep for 10 minutes. For an infusion that you will use to make your syrup, in which you want a strong pine flavor, pack your water with needles and simmer until the liquid reduces by half. We didn’t chop the needles but chopping would have allowed us to get much more needle in the water, making a stronger pine flavor. You probably want to harvest a decent basket full of needles to make this project worth it. Once the needles are chopped, they will take significantly less room in your saucepan. 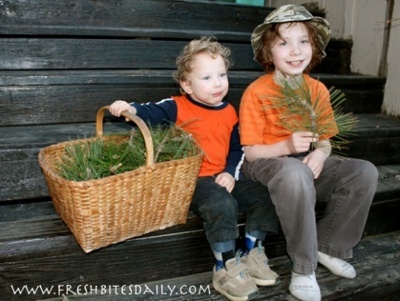 If you over-harvested, you can use the pine needles in a room freshening infusion. Chop needles off stem and chop needles in half or quarters. Cover with water. Bring to a boil. Reduce to a simmer. Simmer until liquid is reduced by half. Strain out liquid. Toss needles. You can refrigerate this infusion for a week or two, using it in teas or other projects. You can hold it longer if you turn it into a syrup. Following the process for any simple syrup, measure your liquid pine infusion and add equal parts sugar. Combine equal parts pine infusion and sugar. Heat until the mixture until the sugar dissolves. Allow it to cool. Use as a syrup. This syrup will keep for weeks in your refrigerator and will allow you a fun sampling of pine in anything you might imagine. We used it in flan. This “flan” might not cut it with traditionalists since the liquid in the syrup kept us from enjoying the characteristic caramelized sugar that marks traditional flan. I also chose to serve it in the custard cups themselves, keeping the liquid syrup in the bottom as a fun flavor discovery. We could have turned it over as you do with flan, but with the extra fluid, eating right out of the bowls just made more sense. It was a fun dessert. Heat 4-5 cups of water in a pot on stove. Pre-heat oven to 325 degrees. Simmer and reduce pine syrup. Add syrup equally to each of 6 custard cups. Scald the cream in a saucepan — watch for the edged to begin to bubble. Remove taking care that it does not boil over. Beat slightly 3 eggs. Mix in 1/4 cup sugar. Stirring constantly, gradually add hot cream to egg yolk mixture. Stir until the sugar is dissolved. Ladle into the custard cups. Pour three cups of the hot water into a large baking dish. Place custard cups in water. Add more hot water to the baking dish until the water level reaches about 3/4 of the way up the custard dishes. Bake uncovered in the water for 45-60 minutes or until a knife comes out clean (when inserted in the center of a cup). Begin to check for donness at about 45 minutes, taking care not to let them burn. This was a fun project that used butter infused with pine. We did find that we lost about 1/8 of our butter in the process — some butter just sticks to the needles. You may have better luck but you may also choose to experiment with a butter that is not particularly expensive. Allow the butter to simmer, covered, on low heat for an hour. Turn off heat and allow the butter to sit overnight. 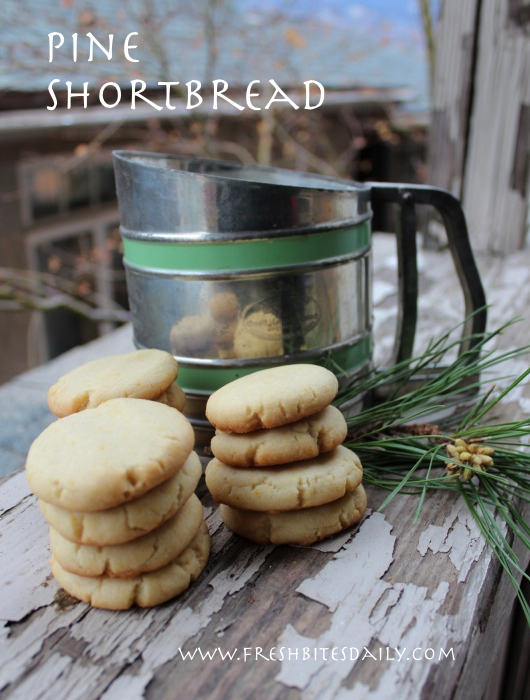 At this stage, we used a basic recipe for shortbread cookies using our pine needle butter and made the most interesting butter cookies I have tasted.